Since the settlement of Louisville in 1778, African Americans have created a history behind the wall of slavery and the veil of segregation, and have forged a remarkably vibrant community that, at times, influenced the political and cultural history of the nation. This community, while not entirely beyond the reach of white Louisvillians, was certainly beyond their field of vision — and its people and its achievements are largely unknown, even to more recent generations of African Americans themselves. Over the past two centuries and more, black Louisville faced many challenges: creating a free black community in the midst of slavery; the struggle to end slavery itself; the struggle to expand the limits of freedom in a segregated society; creating meaning and culture; the struggle to end segregation; and the struggle to expand the limits of freedom in a society in which African Americans are "neither separate nor equal." Louisville African Americans met each of these challenges and, by so doing, they created a community and defined its identity and character. When most successful, they capitalized on their opportunities and assets, the most important of which derived from Louisville's favorable location, the need for black labor, the need for black votes and the presence of a few influential white allies. The resulting economic and political capacity, when used astutely, could wrest concessions from white businesses and political leaders that advanced the interests of the entire African American community. 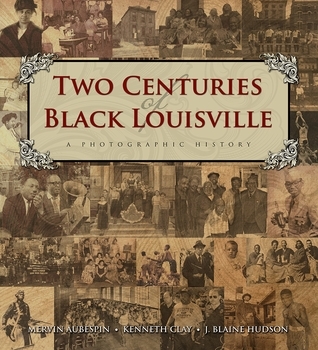 The purpose of Two Centuries of Black Louisville: A Photographic History is simply to tell this story in words and images — a history in which all, irrespective of race and place, can take pride. Mervin Aubespin is a community activist, artist, and retired associate editor of The Courier-Journal. Ken Clay is an entrepreneur, cultural event producer, and retired vice president of the Kentucky Center for the Arts. Dr. J. Blaine Hudson is a community activist, author, and dean of the University of Louisville College of Arts and Sciences.